You know this story…It was a 3:15 wake up call to make the 6am flight. 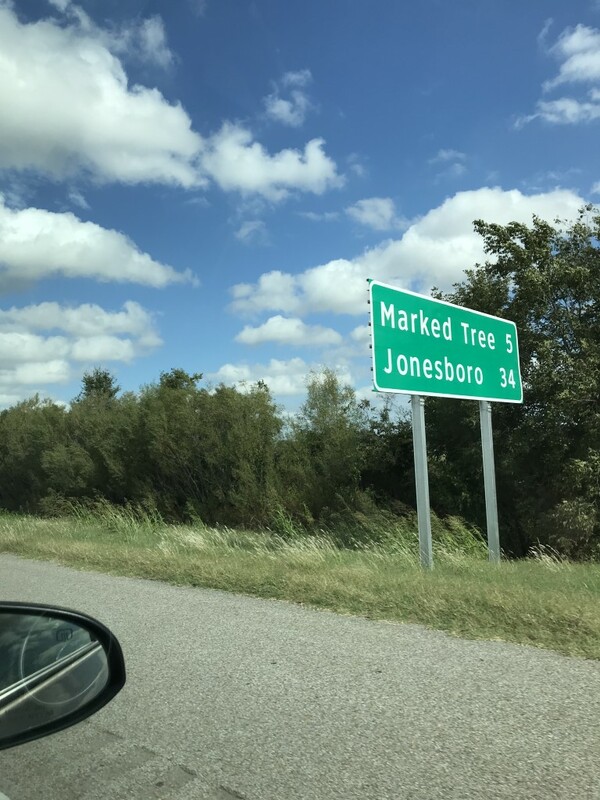 But this one was a tad different as we were headed to Islip for our Southwest flight to Memphis via Baltimore for the midweek trip to Jonesboro, Arkansas to see the Arkansas State Red Wolves. I much prefer the Islip airport to either JFK or LGA even if it is a bit further. And the timing could not have been better now that Al has partially moved to NYC. We arrived at Islip well in advance. So much so, that the Southwest kiosks had not been turned on yet. Al had to download the Southwest app in an attempt to get his boarding pass. With no luck, we had to await the Southwest counter to open and the kiosks to be turned on. Al needs to get that sorted out as our early November trip is on Southwest as well. After clearing security (I am glad that Islip finally has a dedicated TSA Pre Check lane), Al made the usual pit stop at Starbucks. I think he was in withdrawal, as he made a point to state that Venice does not have Starbucks. I should digress and tell you that Al arrived just hours previous from a weekend trip to Venice. Yes, the one in Italy. No, it was not a football trip. I think it was a not so new romance trip. There were no counting issues on either Southwest flight, no connection issues in Baltimore, no emotional support squirrels that needed to be removed from any flights, and no other issues of any sort. Thus we arrived in Memphis ahead of schedule and even a bit more rested despite both of us thinking the woman in the middle seat was spilling out onto us. So either she was larger than she appeared or the middle seat was smaller than it appeared. I am still not sure which is correct. We grabbed the rental car and headed off to Jonesboro, a mere hour drive from Memphis. Yes Al, we should have flown directly into Jonesboro. 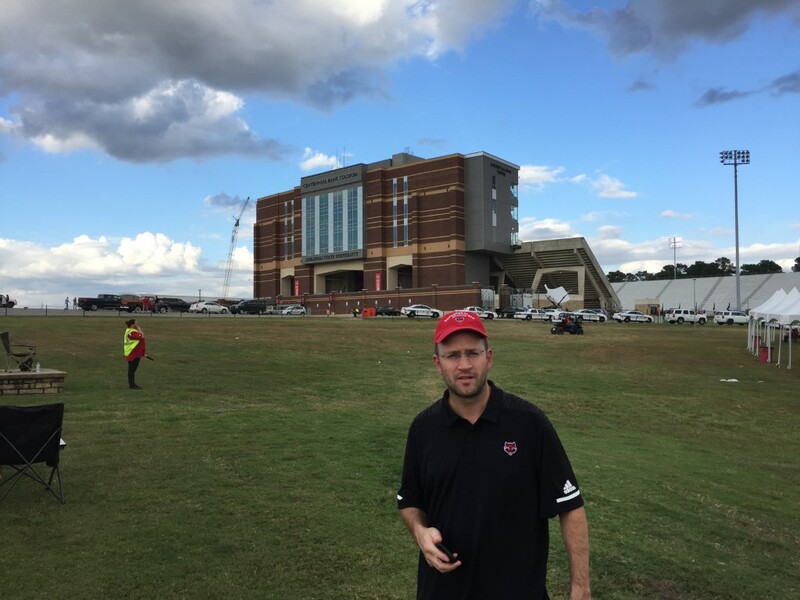 We headed directly to First National Bank Arena and the Red Wolves athletic offices to meet up with Rich Zvosec. 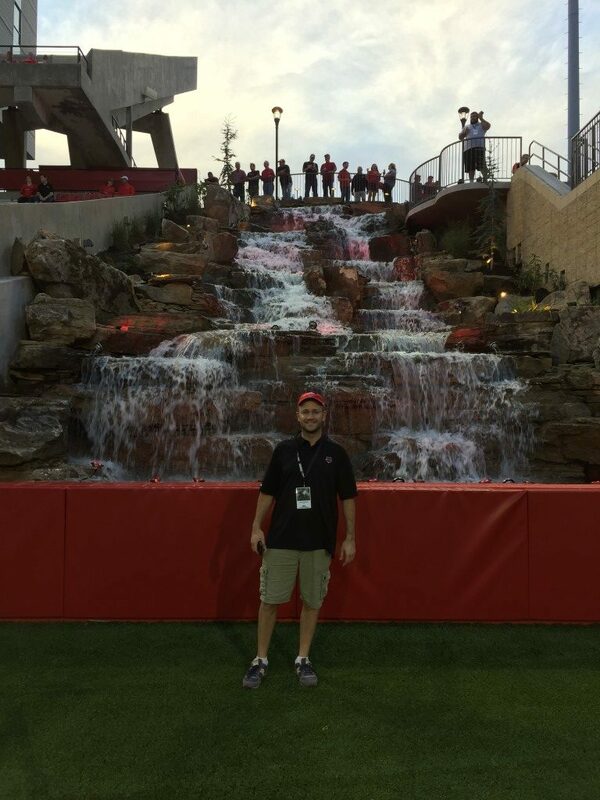 Al met Rich along the road somewhere, and remembered that he was at Arkansas State. Rich was previously a Division I basketball head coach at St. Francis here in NYC, and is currently a college basketball commentator for one of the major networks. He was happy to hear some of “his people” from NYC were coming to visit, and was really accommodating for our trip. Of course, Al having gotten in late the night before, didn’t get to Junior’s on time to bring a cheesecake (you had one job Al) to Rich, but we’ll take care of that later. Rich was interested in the Quest, our whereabouts, and if we had seen any “water features” along the Quest. The answer was no, and we were intrigued. You can see Rich’s full bio at Rich’s Bio. Given Rich’s very diverse background our lunch conversation was fascinating. Rich had some very good stories to share as well as some very interesting questions of us, some of which we have not been asked before, including what were some of our most disappointing trips and/or events on the Quest. 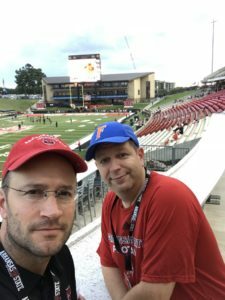 We swapped stories of remote places we have ended up (Cagle Steaks), unusual venues (Houston basketball arena), and things that surprised us both positive and negative. I have to say that on one hand it felt like catching up with an old friend that you haven’t seen in 20 years but on the other it was uncharted territory. 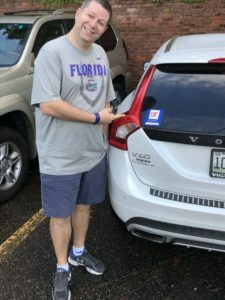 Rich’s diverse background and probing questions really led to one of the more fascinating discussions we have had and led down a path that I do not think we have been down before. Al notes that he was very jealous of the “not to be mentioned by name” quest that Rich and his friends are on, an annual pilgrimage to a random city in the United States to perform in an olympics amongst friends with all sorts of events. Al is hoping for a guest invitation sometime before he can’t walk or run anymore. Very cool stuff. 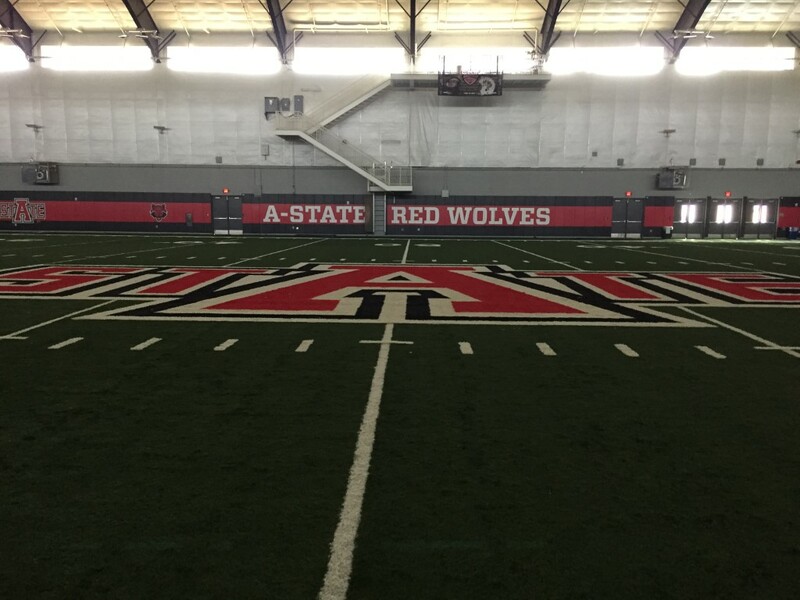 After lunch, we headed out on a tour of Arkansas State. First stop, was downtown Jonesboro. 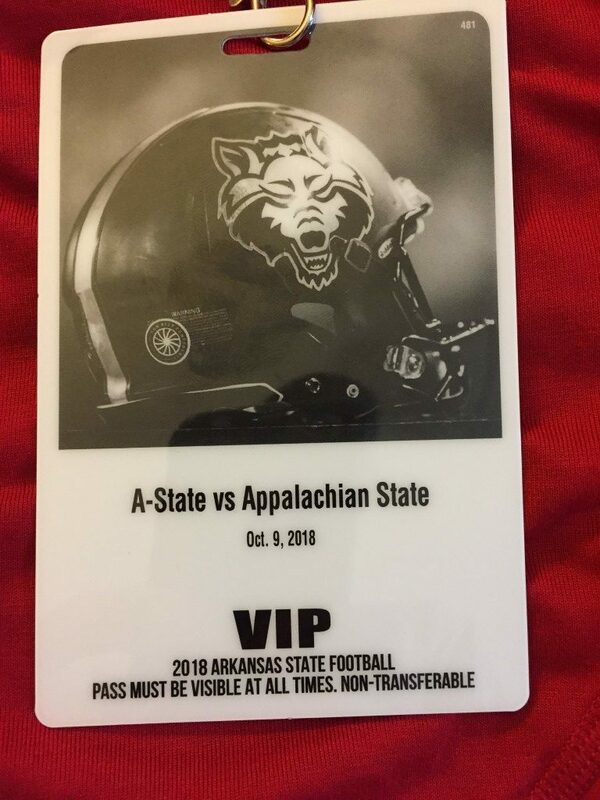 With not much to see, very soon it was onto the Arkansas State campus. We toured the athletic facilities and a bit of the campus. One stop on the tour was the indoor practice facility. It is quite a nice facility. Technically, it is called the Student Activities Center. 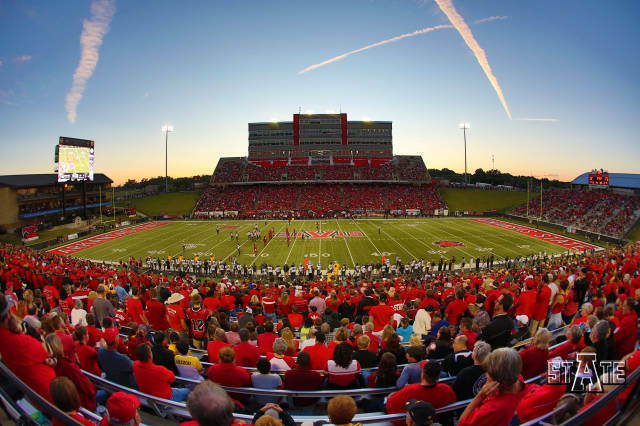 This facility is used not only for football, but is used by the student body for intramurals, clubs, organizations, campus recreational activities, and is open for general student use at night. This is because the facility was funded by student fees. And the north wall bears the name of all students whose fees supported the building of the facility. 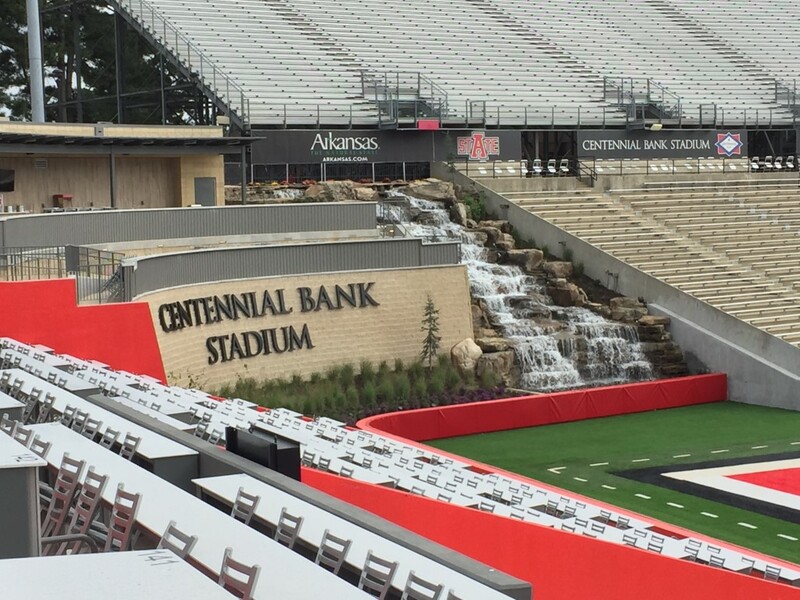 The next stop was Centennial Bank Stadium. 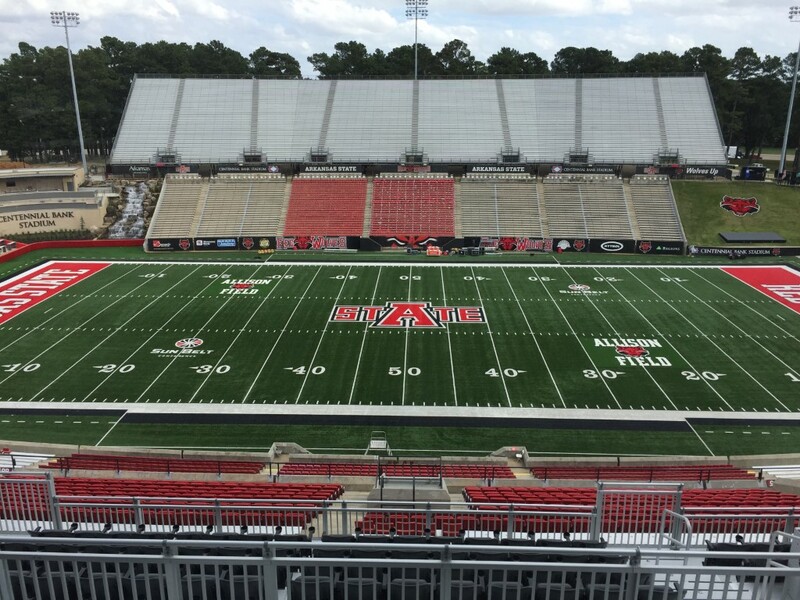 Thanks to some recent gifts to the Red Wolves, the Stadium is in the midst of some significant improvements. Some of which are already completed and some of which will be completed for next season. One of the end zones has been renovated into loge/club seating with club level food and beverage in the corners. Each corner also features a running water feature including a waterfall. You must see the pictures to believe it. It is quite nice. We also headed up to the club level seating area which is also quite nice. 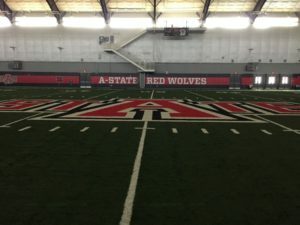 With all due respect to the Sun Belt and its member institutions, the facilities at Arkansas State befit an institution in a higher weight class. 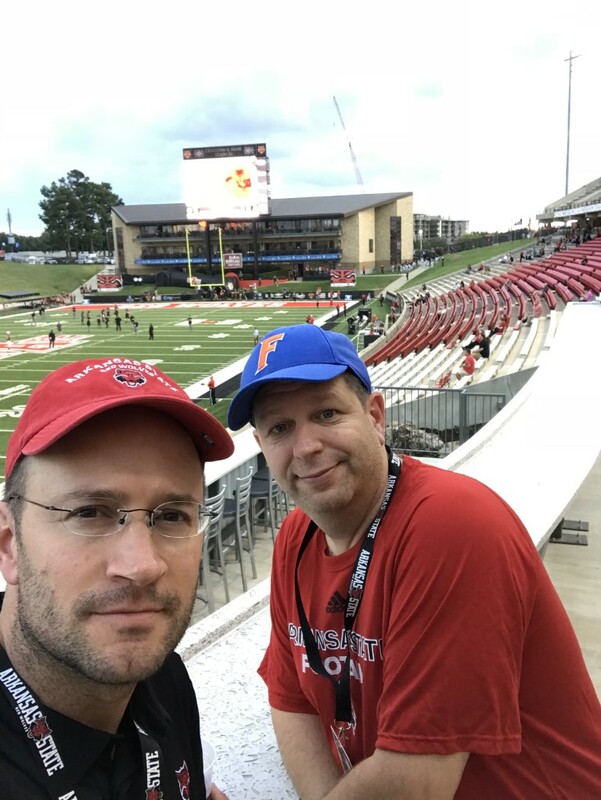 Although to be fair, this is our first Sun Belt trip, so we may be completely off base and victim of reputational bias. The point I am trying to make, is that we were impressed over our expectations. Terry Mohajir, the Athletic Director at ASU since 2012, and his team, deserve high accolades for what they have been able to achieve. One can only assume that Mr. Mohajir and his team are quite skilled at fundraising, either that or convincing banks to loan them lots of money and creating a crushing debt service. I think it’s the fundraising. After a very nice tour, we parted ways with Rich. We headed to the bookstore and I bought the usual game tee shirt and shot glass. Al bought his usual Al tee shirt. Then we headed to the hotel to check in and get a bit of rest before the game. 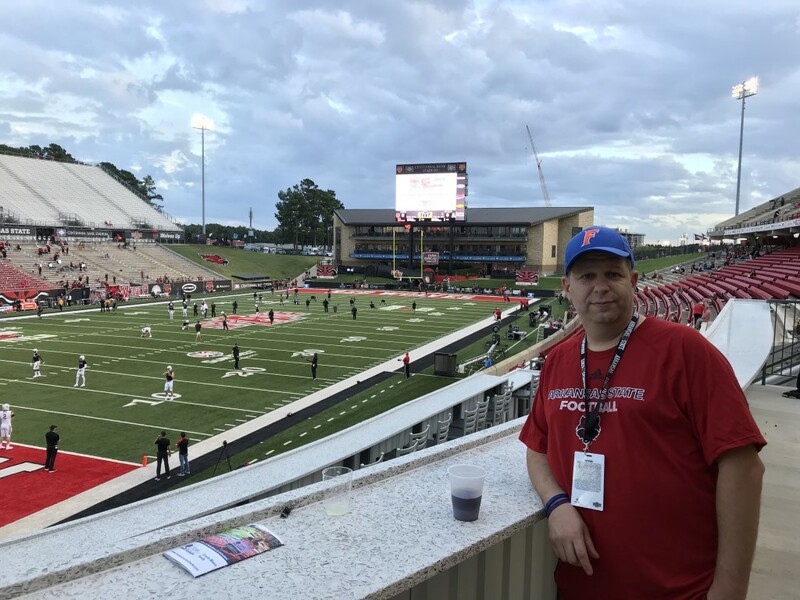 After a bit of rest at the hotel and my declaration that if I don’t get out of here I will be too far asleep to leave, we headed out to the game. Pre game tailgating was a bit light given the Tuesday night game. But I will say that we have seen worse. We headed inside as there was some significant handicapping to be done. Al made his pick the minute he saw the spread. To be fair, he also saw the ASU rushing defensive stats. I was looking for a reason to pick ASU. We met up with Rich and walked around to the end zone club to take in the environment and hospitality before heading down to the field for pre game warm ups and introductions. The time came and I locked in the upset pick. Jarrett picks Arkansas State and Al picks Appalachian State. 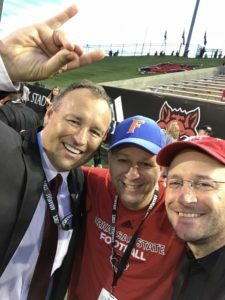 As we were standing with Rich on the ASU sideline, Al made his pick with a nod and a wink as opposed to a verbal statement, but his intent was clear. Let’s start by stating that the over/under on this game was 60. So there was an expectation of some offense. Only one team delivered and I think that is even a stretch and existed only on the scoreboard. ASU took the opening possession 3 plays 0 yards and a 10 yard punt. App State did a notch better going 3 yards in 3 plays. A 4th & 7 pass fell incomplete and ASU took over on downs. 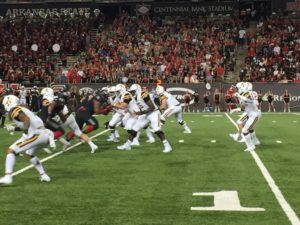 We then had our first drive of the game as ASU took 11 plays to go 54 yards to kick a 31 yard field goal and a 3-0 lead. The problem was that it would be doubtful that field goals would be enough to win this game. But ASU had the first points. The teams would trade multiple punts for the remainder of the 1Q. 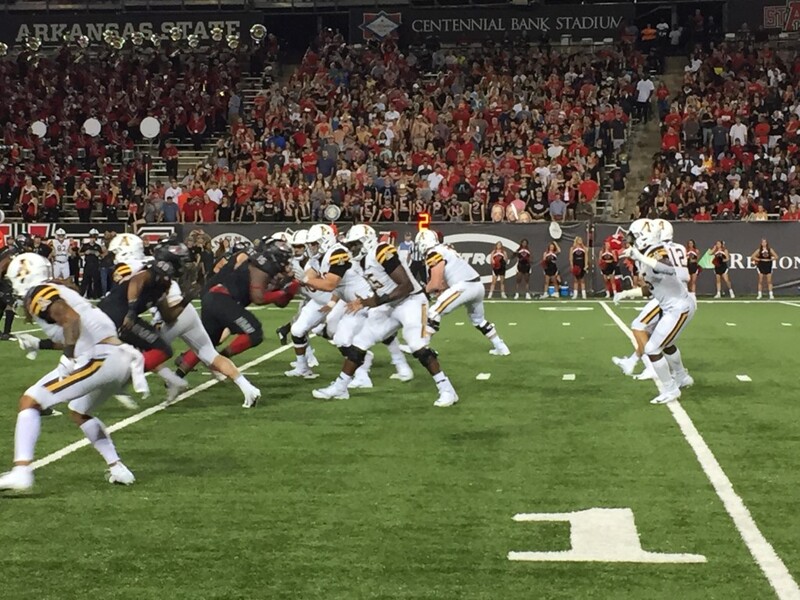 ASU opened the 2Q with a drive that would lead to a 47 yard field goal and a 6-0 lead. Maybe field goals would be enough. App State would need 4 plays on the ensuing drive, capped off by a 27 yard rushing TD, for a 7-6 lead. ASU took the next possession down to the App State 27, but failed on a 4th & 2. But, the ASU defense held firm, forcing a three and out. This would then lead to a ASU 33 yard field goal and a 9-7 lead. Here’s the problem at this point in the game for ASU. Their defense was holding firm and limiting App State. But the offense was only getting field goals and failing to capitalize on opportunities. You have all seen this game. One team outplays the other, but is only up by a little and you just know it can’t last. That was this game to a T. On defense, ASU was up to the task, but you just did not know how long that could last. So, you know what happens next. A 4 play App State drive for a 14-9 lead. After an ASU interception, 3 plays later it was 21-9. 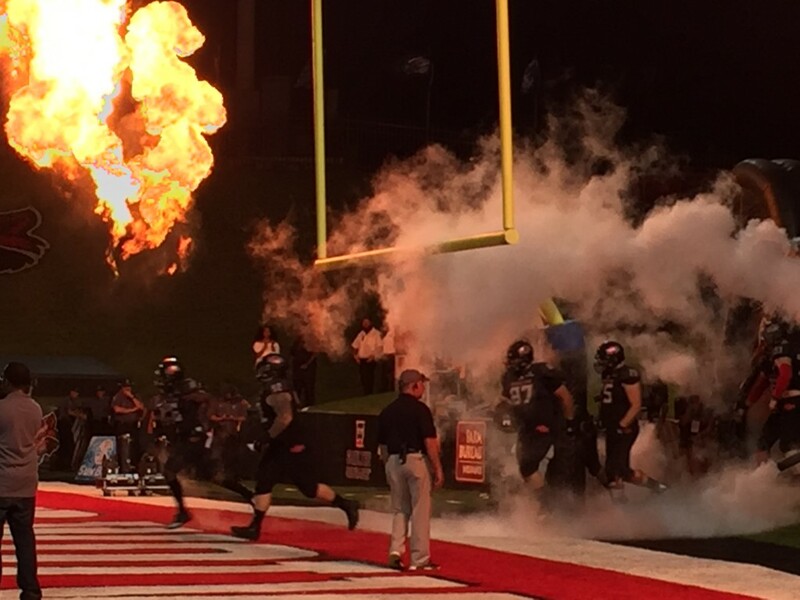 After a tough fought half that was in my view mostly an evenly played half, it was 21-9 App State. Total yards in 1H 226-187 ASU. It was very clear that ASU would have trouble recovering from a 1H in which they outgained App State, yet trailed by 12. All that needs to be said about the 3Q was that App State outgained ASU 129-27 and outscored ASU 7-0. The 4Q, was a mere formality with the App State QB Zac Thomas reeling off a nice 62 yard run for the only score. Final score App State 35 ASU 9. App State closes the game with 28 straight points. My quick analysis, without looking at any film, on offense, ASU was very predictable. App State was jumping ASU’s short passing routes and ASU was failing to stretch the field and force App State to back off. But ASU was unable to accomplish this, partly due to the pass rush. I must also offer one small amount of criticism towards the ASU play calling, how many times on third and fourth and short do you run up the middle and fail to get the first down before you try something else? Al gains a game on me. After the game, it was back to the hotel for some well needed sleep. The next morning it was an early wake up because Al wanted to meet a friend in Memphis for breakfast before heading to the airport. Yes, Al does have other friends. And yes, people do live in Memphis. After the hour drive to Memphis, we met at Sunrise Memphis. If you happen to find yourself in Memphis, other than questioning your life choices (just kidding, do not send hate mail), you should eat breakfast here. But Al would add, only go on Wednesday’s because that is Waffle Wednesday’s. The biscuit sandwiches are quite good. Al notes that it was good to catch up with Kenny who moved to Memphis years ago looking for Elvis. After breakfast, we headed to the Memphis airport for the return flight home to Islip via Baltimore. Memo to Southwest Airlines, the Memphis airport does not have any kiosks. Al had to wait online to get his boarding pass. Leaving aside Al’s incompetence at not being able to get his boarding pass via the app, why no kiosk? Al’s sports Quest fantasy did come true while awaiting our flight to Baltimore. Our incoming flight was carrying the UCF women’s soccer team. But alas, Al was not wearing his UCF hat so he could not say anything for fear of being that creepy old guy, instead of just that creepy old guy in the UCF hat. The flights back to Islip were uneventful and I even had an open seat next to me from Memphis to Baltimore. We landed in Islip and it was a quick jump to the car and then to my house. Al then had to take the train to NYC. I like Islip. During the game, we were able to meet and spend a few moments with ASU Chancellor Dr. Kelly Damphousse. Dr. Damphousse was very hospitable and we had a very engaging conversation about his background and tenure at Oklahoma, our Quest, some of our Quest stops, and where we should head next. 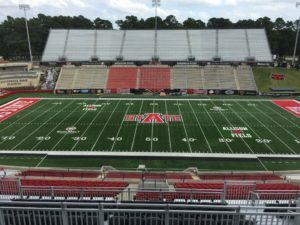 A very sincere thank you to Rich Zvosec for the kind hospitality during our time in Jonesboro. We expect to return the favor the next time you find yourself in New York or should our paths cross at another destination. And the cheesecake is on its way. I will say that during this Quest, we have met some very nice people and been treated very well by some very nice people. The hospitality shown to us by Mr. Rich Zvosec, Mr. Terry Mohajir, and Dr. Kelly Damphousse was exceptional and we are truly grateful. If we can ever return the favor for any reason, please let us know. 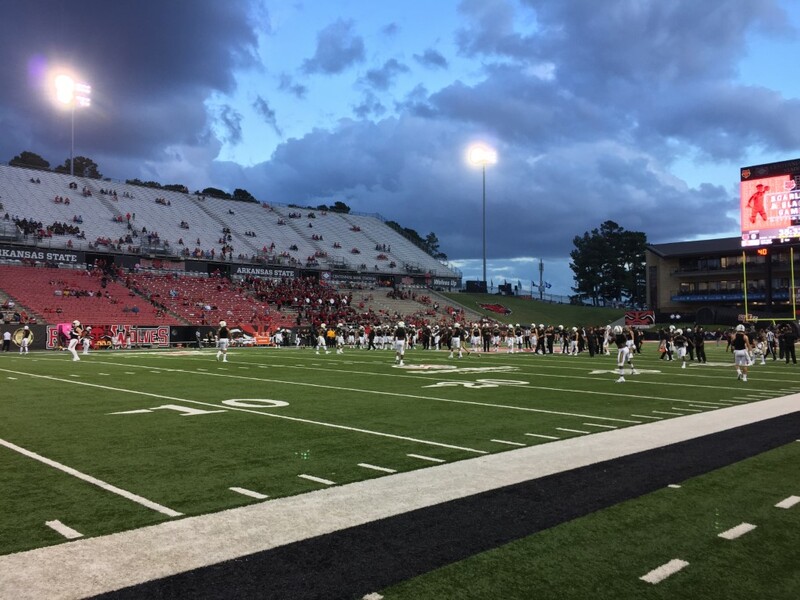 Arkansas State would win 5 of its last 6 games after this one, but the one loss was crucial as it was to Louisiana. 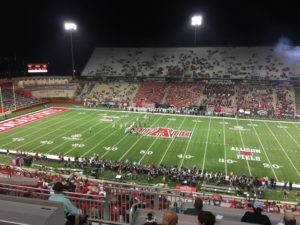 Thus, the Red Wolves lost the Sun Belt West tiebreaker at 5-3 to Louisiana. 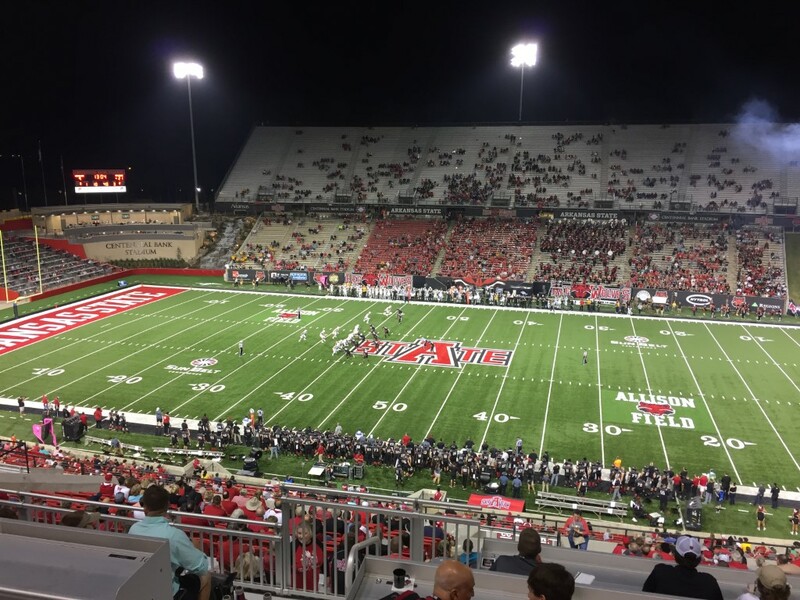 Arkansas State advanced to the Arizona Bowl, losing to Nevada 16-13 in overtime. 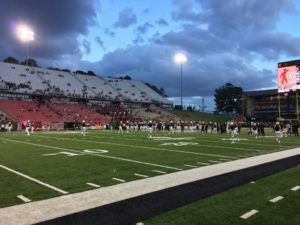 Appalachian State would win the Sun Belt East at 7-1 and beat Louisiana for the Sun Belt title. This earned a New Orleans Bowl berth where the Mountaineers beat Middle Tennessee State 45-13. 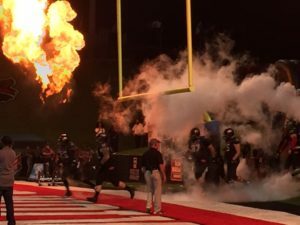 Appalachian State finished the year at 11-2 only losing to Penn State and Georgia Southern. Coach Scott Satterfield departed for Louisville and the Mountaineers hired NC State OC Eli Drinkwitz as its next head coach. 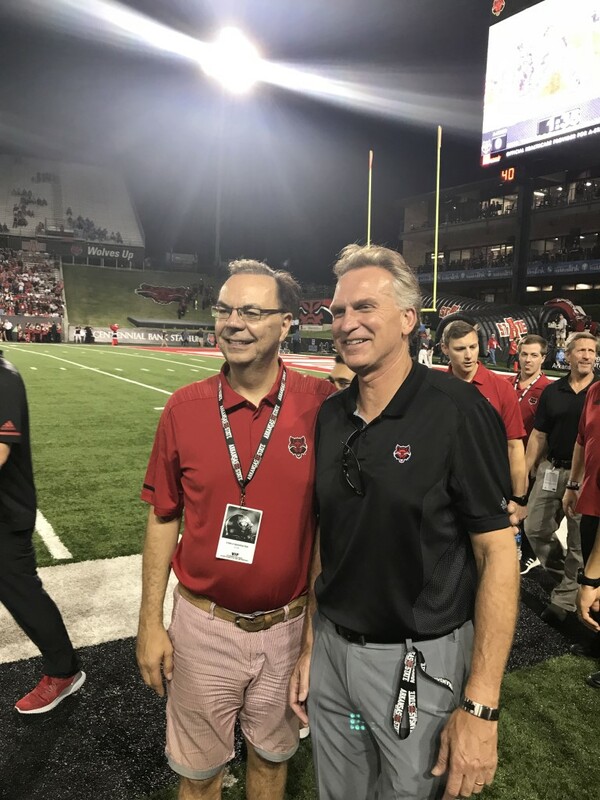 Photo Gallery For our Arkansas State photo album, Please click here. You can view as a collage or run as a slideshow. There are comments to explain what is in the photo but most are self explanatory. Thanks to Google, I can no longer embed the slide show with comments.